The critically acclaimed Milwaukee Symphony Orchestra, under the direction of conductor Stuart Chafetz, performs Friday, April 1 at 8 p.m. in the Lawrence Memorial Chapel as part of the 2010-11 Lawrence University Artist Series. Tickets, at $30 for adults and $15 for students, are available through the Lawrence Box Office in the Music-Drama Center, 420 E. College Ave., Appleton or by calling 920-832-6749. The orchestra’s seven-piece, all-Russian program will include Shostakovich’s “Symphony No. 9” and Tchaikovsky’s Waltz from the ballet “The Sleeping Beauty” as well as works by Gliere, Glinka and Prokofiev. Hailed by the Milwaukee Journal Sentinel for their performances that “crackle with energy,” the 88-member Milwaukee Symphony Orchestra is recognized as one of the finest orchestras in the country, performing more than 140 concerts each season. The MSO has toured Europe, Japan and in 1999 became the first American orchestra to perform in Cuba since the late 1950s. Chafetz, known for his ability to engage audiences, is increasingly in demand with orchestras nationwide. His guest conducting appearances include The Buffalo Philharmonic, Chicago Symphony, Detroit Symphony, Florida Orchestra, Honolulu Symphony, Louisiana Philharmonic, Louisville Orchestra and Toronto Symphony, among others. His work also includes collaborations with a variety of classical and pop artists, among them George Benson, Regina Carter, Natalie Cole, Jean Phillipe Collard, Marvin Hamlisch, Thomas Hampson, Jason Scott Lee, Randy Newman, Jon Kimura Parker, Bernadette Peters, Preservation Hall Jazz Band and Chee Yun. 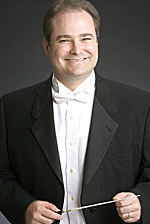 A graduate of the Eastman School of Music and the University of Cincinnati-College Conservatory of Music, Chafetz was principal timpanist of the Honolulu Symphony for 20 years and served as music director of the Maui Symphony and Maui Pops Orchestra from 1999-2009 before joining the MSO. Well-known for its ventures into new technologies, the MSO has been doing national radio broadcasts for more than 30 years. In 2005, the MSO became the first orchestra in the country to offer their live recordings for download through online music stores.